Before diving into the Territorial Agenda and its ‘universal framework theories’, we share some thoughts about the territorial situation and trends we face today – making the case for a territorial re-capitalization. 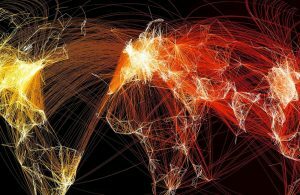 Extracted from reliable and authoritative sources, we briefly depict a global territorial portrait based on the past and current urbanisation trends, affecting all earth’s spaces, including rural areas and wider ecosystems. 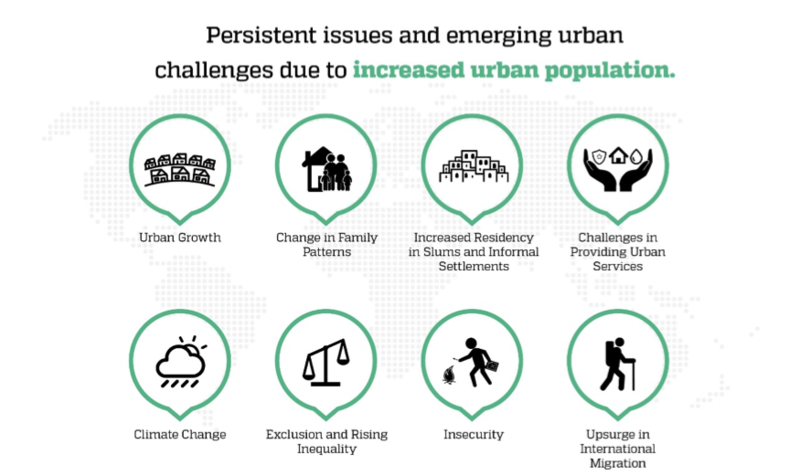 Urbanisation is an unprecedented challenge. While in 1900 less than 1 Billion or 20% of the population lived in cities, a century later 3,5 Billion and half of humanity was urbanised. In half of that time, it is expected that the urban population will double with a share of 70% of or more of the total population . By the middle of the century a large majority will be living in small and (very) large cities. Urbanisation and development are inextricably linked, and it is necessary to find a way of ensuring the sustainability of growth. Urbanisation had become a driving force as well as a source of development with the power to change and improve lives. 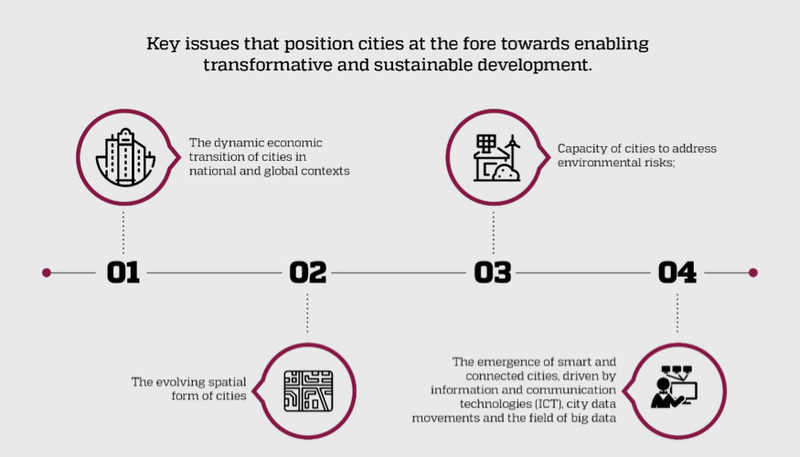 Despite numerous planning challenges, well-managed cities and other human settlements can be incubators for innovation and ingenuity and key drivers of sustainable development. The top 600 cities, with 20 % of the world’s population, produce 60 % of global GDP. More than 880 million people and 30 % of the urban population live in slums or slum-like conditions. In sub-Saharan Africa, the proportion was 55 per cent, the highest of any region. This estimate does not include people in inadequate or unaffordable housing (defined as costing more than 30 per cent of total monthly household income). As the urban population increases, the land area occupied by cities is increasing at a higher rate. It is projected that by 2030, the urban population of developing countries will double, while the area covered by cites could triple. 79% of the megacities are located in Latin America, Asia and Africa. Built-up areas of developing-country cities will increase 300% by 2030 while their populations double and industrialised-country cities are projected to expand 150 % while their populations increase by 20%. 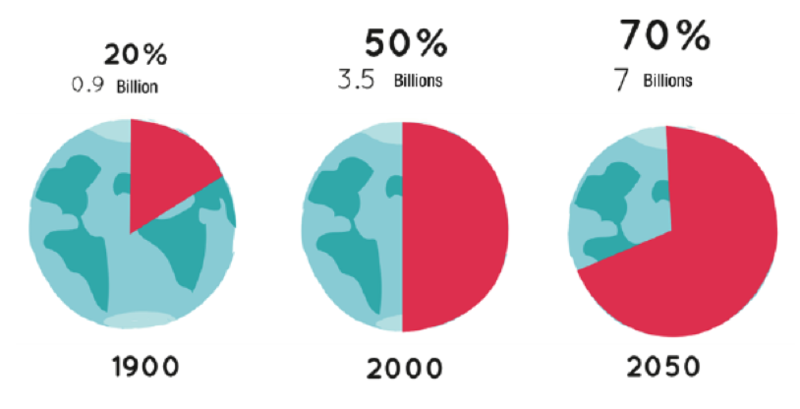 An estimated 60 % of the built environment needed to accommodate the earth’s urban population by 2050 is not yet built. By 2025, the growth in the number of households is projected to be 2.3 times the population growth rate in the world’s top cities. For every 10 per cent increase in urban sprawl, there is a 5.7 per cent increase in per capita carbon dioxide emissions and a 9.6 per cent increase in per capita hazardous pollution. This illustrates the important interlinkages across the goals and targets. Likewise, managing solid waste is often problematic in densely populated areas. In fact, in many developing regions, less than half of solid waste is safely disposed of. As per capita waste generation continues to rise, the collection and safe disposal of solid waste will continue to require serious attention. Urban air pollution also challenged cities around the world, causing illness and millions of premature deaths annually. Around half the global urban population was exposed to air pollution levels at least 2.5 times higher than maximum standards set by the World Health Organisation. 142 countries have a National Urban Policy in place or under development. Those countries are home to 75 per cent of the world’s urban population. The current model of urbanisation is unsustainable in many respects. Many countries and cities all over the world are grossly unprepared for the challenges associated with current and future urbanisation. However, when well-managed, urbanisation fosters social and economic advancement and improved quality of life for all. 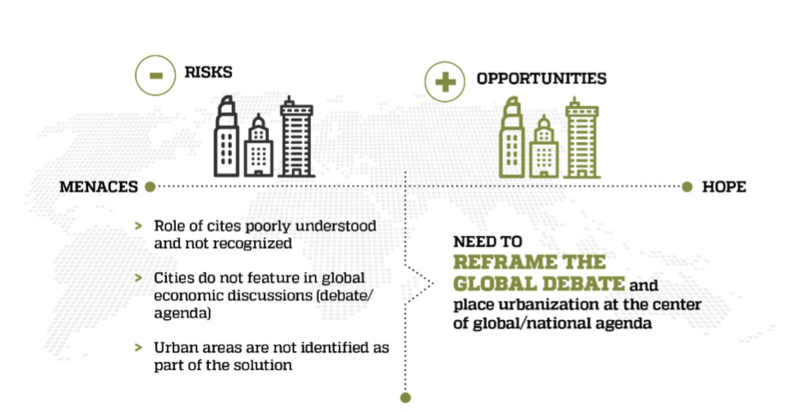 Cities are the platforms for global and local change in the 21st Century. Urban landscapes are the spaces of convergence of economies, cultures, political, and ecological systems. The economic and social futures of whole countries, regions, and the world will be made in cities, today’s nests of ‘emerging futures’. If democracy is to survive it will have to resist internal populism and embrace external cooperation. Also in ‘Leading Change’, world-leading planning experts raise a stark warning there is no further time to lose to fundamentally change the way we plan, shape and manage our settlements and by extension the entire planet, calling out for a new territorial approach that blends, transcends and transforms traditional urban, rural and environmental planning.